I’m really loving Consumer Reports magazine; we’ll definitely be renewing when the current subscription ends. 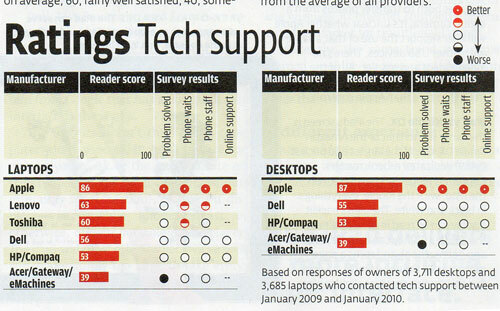 The most recent issues is all about computers, and as an Apple fan I just have to post this chart ranking computer makers on their tech support. Apple is so far out in front it’s not funny. I should also mention that Apple had the highest-ranked computer in every category where it had an entry; that includes all sizes of laptops, all desktop models, etc.